Your rabbits should produce up to 300 droppings every day. They should be large, round and golden brown, and made up mostly of chewed up hay or grass. And that’s because 85% of your rabbits’ diet should be grass or hay. If your rabbit starts to produce fewer droppings or if they become smaller, darker and misshapen, sometimes strung together, or joined by undigested fur or hay, there is a problem. Look at what they are eating. Is it 85% hay or grass, 10% leafy greens and 5% nuggets? Are your rabbits moulting and swallowing more fur than usual? (Remember that they will groom each other!) Are they eating something they shouldn’t or having too many treats? If there are things you can change improve in their diet, do that. If they are moulting, brush them at least once a day and preferably more often. They can cope with some fur in their gut, but at the time of moulting it could be too much. Check there are no toxic plants around, or any that can’t be digested. For example, rabbits cannot digest bamboo so if there is some in your garden, fence it off. Is something affecting their appetite? When were their teeth last checked? If they have spurs on their teeth it’s going to be too painful for them to eat very much and this will only get worse. Ask your vet to check your rabbit’s mouth for any sign of spurs or abrasions to the cheeks or tongue at every visit (they should be visiting your vet for vaccinations once or twice a year, this is an ideal opportunity). What if my rabbit stops eating? This is an emergency and the only advice we can give you is to GO TO A RABBIT SAVVY VET NOW. Don’t wait until tomorrow – that may well be too late and your rabbit may die a horrible death. Rabbits are good at hiding signs of disease, and if their guts slow down or stop moving, this isn’t just painful, it’s potentially fatal. Don’t try and fix the problem yourself, by giving your rabbit pineapple juice for example, that won’t help and its high sugar content may make things worse, unless advised by your vet. 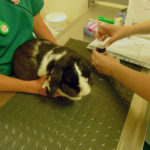 DON’T GIVE YOUR RABBIT ANY GUT MOTILITY DRUGS without the rabbit first being physically examined by a vet. If there is a blockage in the gut and your rabbit is given gut motility drugs it can cause a rupture which will be fatal. In short if the appetite goes and/or the poos stop, CONTACT YOUR VET NOW, this is an emergency.